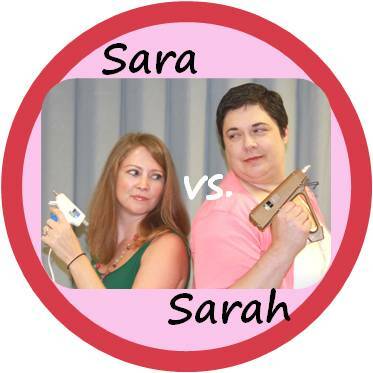 Though Sara vs. Sarah is no longer an active blog, you can now find Sarah posting at The Thrift Store Crafter. Thank you everyone for your continued support!! For my first So You Think You're Crafty challenge, I decided to try my hand at fused plastic. 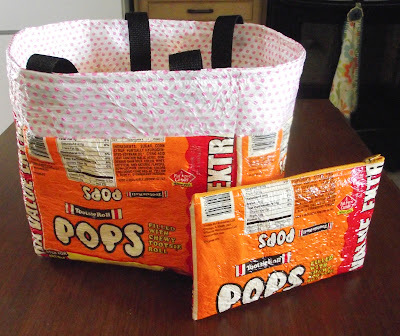 Since the theme was dollar store crafts, I used plastics you could find at the dollar store: Tootsie Pop bags, a plastic tablecloth and trash bags. I also used some cellophane (the pink polka dots), but that did not work very well so I don't recommend it. 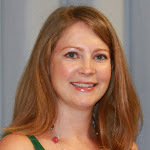 Any-who, The first thing you need to do is cut your plastics down to a usable size. 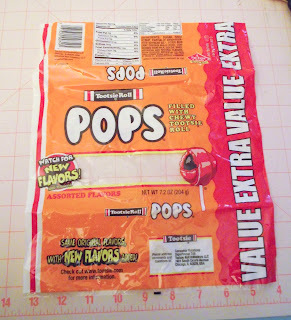 Since the smallest piece I had to work with was my Tootsie Pop bag, I cut the tablecloth and the garbage bag to that size. 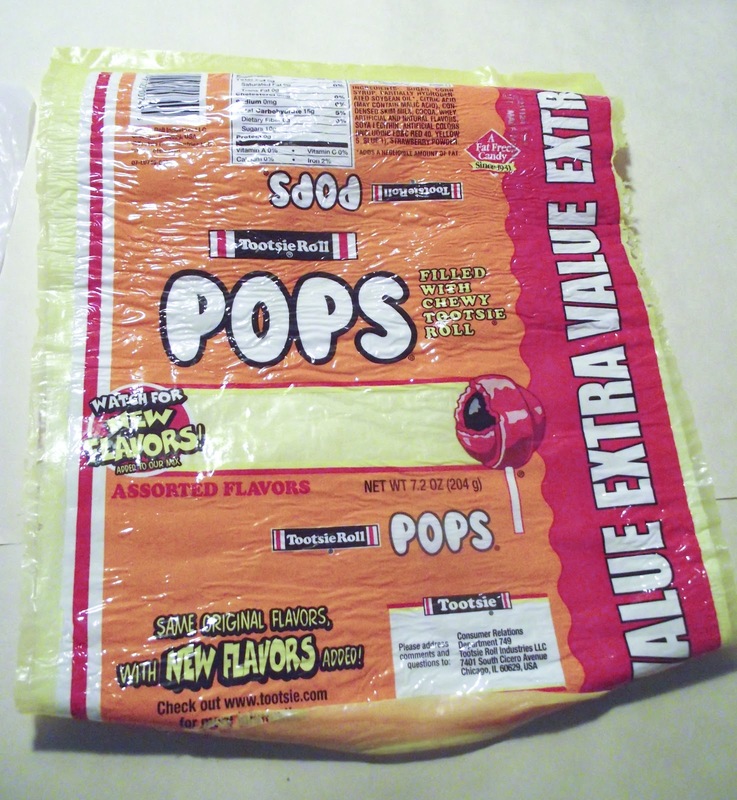 I carefully cut open my Tootsie Pop bags. 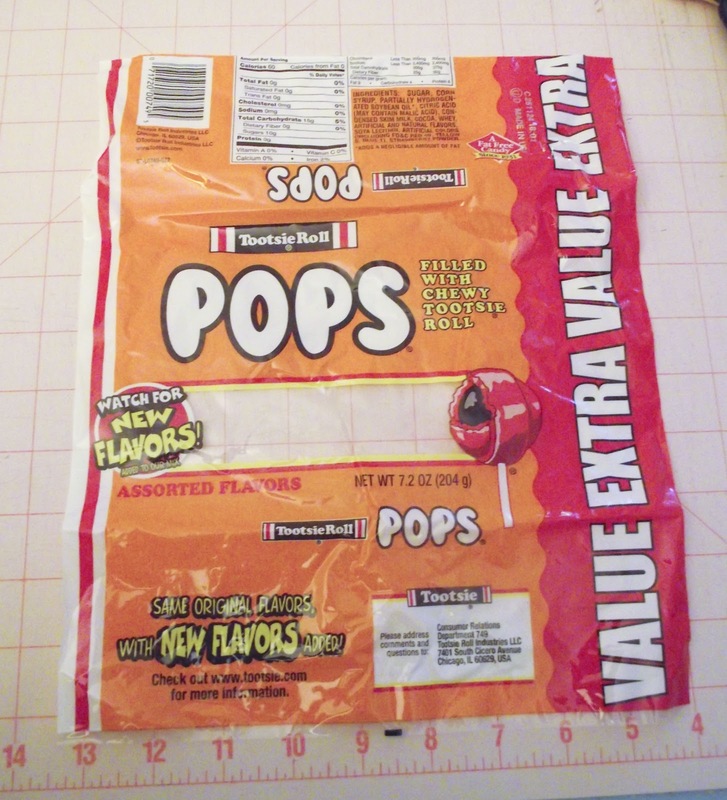 I cut rectangles of the tablecloth that were approximately the same size as the Tootsie Pop bag. I cut more rectangles of the garbage bags. 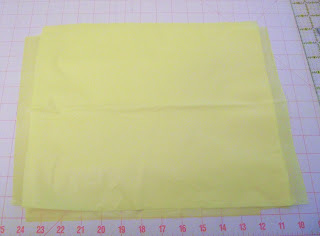 In all, you need about 6 layers to make one piece of fused plastic "fabric." You don't really need to use a plastic tablecloth; I did because I wanted the yellow to show through the clear parts of my Tootsie Pop bag. You don't even have to buy garbage bags--you can use bags from the grocery store. I bought my materials because I was going for a certain look. Next, line up your layers. I used four layers of garbage bags, one layer of tablecloth and my Tootsie Pop bag. THIS IS IMPORTANT!!!! 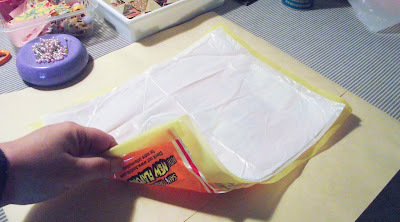 You want to put paper underneath and on top of your layers of plastic. If you don't, your plastic is going to melt all over everything. I'm going to say it again. Sandwich your plastic layers between paper so the plastic doesn't melt all over everything. The next step is to iron your layers together. Remember, everything is protected between the layers of paper (sorry, I just had to say it again). Unfortunately, I don't have a picture of the ironing because I don't have four arms or someone else around to take the photo. You want to use a hot iron (wool or linen setting). You need to keep the iron moving constantly. 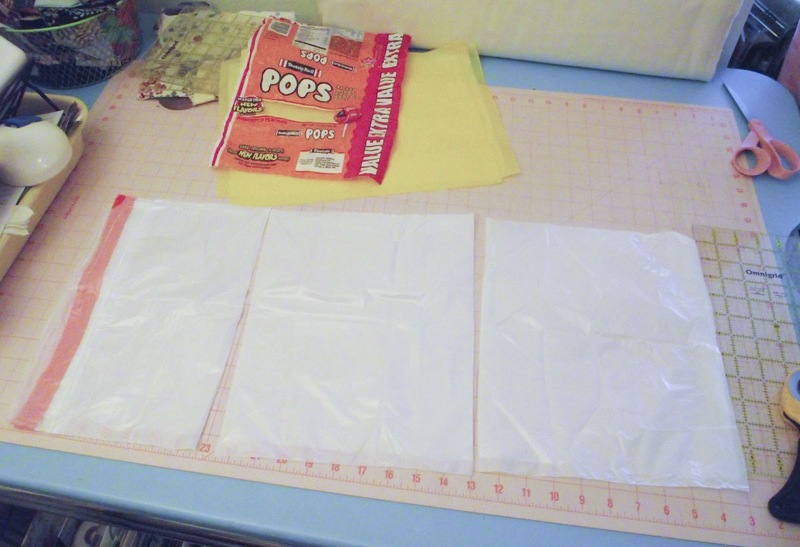 Make sure you iron over the entire area of your plastic. I worked in a circular motion. 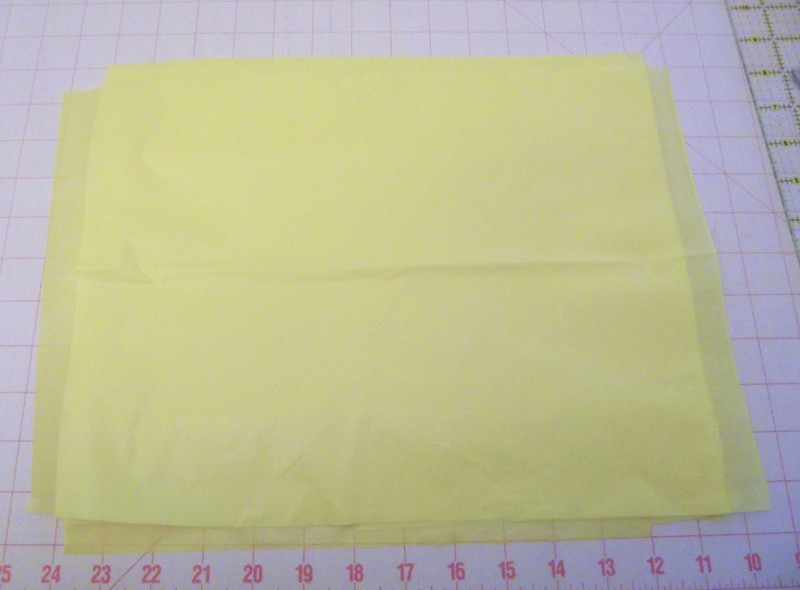 Once you've covered the entire piece, peel off the top layer of paper and see how you did. If you need to go back and fuse some more, you can do that. Just don't over-do it for the plastic will melt completely. You're now ready to cut this down and start sewing with it. This stuff stands up to being sewn great. I was afraid that it would tear easily, but it is strong as can be. It also has great body so it's ideal for bags as it holds it shape. I've been using my tote bag for my daily lunch bag at work for a month and it is showing no wear whatsoever. So give this technique a shot. So I made it through Dollar Store week at So You Think You're Crafty. Woo-hoo! 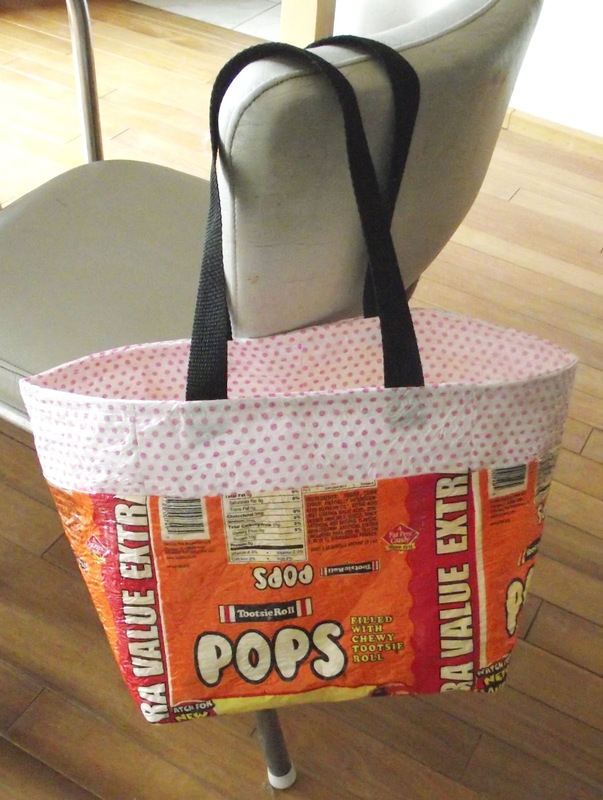 My project, if you didn't guess it, was the Tootsie Pop tote bag. This was a cool technique and I'm going to do up a tutorial on it when I have a little more time. Hey everyone! The voting is live at So You Think You're Crafty! The theme this week is Dollar Store Crafts. Be sure to go vote for you favorite--maybe it will be mine. Also, don't forget that we have a giveaway going on. You can win three cans of Simply Spray Upholstery Fabric Paint--it's a great prize! 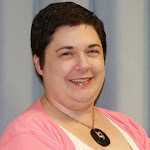 Just leave a comment on this post by Friday April 13, 2012.